Telangiectasia or Spider veins are dilated venules (small blood vessels) that appear in a bulging, protruding manner that are close to the skin’s surface (mucous membranes). They are often small blood vessels measuring between 0.5 to 1 millimetre (diameter). These patterns cluster together to give web-like structure, hence the name –Spider Veins. Although blood vessels are present everywhere on the body, spider veins are commonly seen on the face (mainly around the lips, nose, fingers, chin and the cheeks) as well as on the legs. However, the spider veins on the legs often have underlying venous reflux. These are also called varicose veins. They appear specifically on the upper legs and thighs, as well as around the ankles. 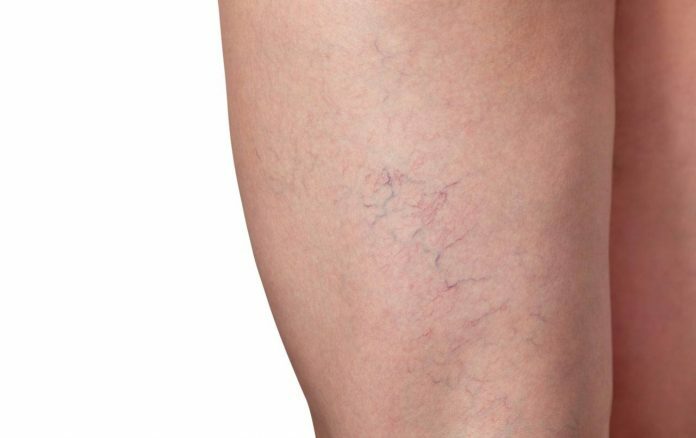 Spider veins are mostly benign, but sometimes they can be the symptom of a more serious illness. For instance, HHT (hereditary haemorrhagic telangiectasia) is genetic condition that can make spider veins a life-threatening problem. Instead of appearing on the face, it can show up on the liver. If it bursts, it can cause massive internal bleeding. Unfortunately, with most skin inflictions, there are going be some skin discolouration and hyperpigmentation. Spider veins are not different. You can treat discolouration and hyperpigmentation caused by spider veins by using cosmetic treatments such as chemical peels, Laser toning treatment, microdermabrasion, topical cream containing glycolic acid, kojic acid and arbutin etc. It is ideal to treat such cosmetic skin problems once the spider veins are completely cured. Trying to eliminate discolouration and hyperpigmentation while the spider veins are prominent may cause the problem to aggravate. How are spider veins diagnosed? Spider veins must be diagnosed by a physician who specializes in vein care/ peripheral vascular disease. They are officially known as vascular surgeons or phlebologists. In order to treat Spider veins, certain lifestyle habits must be changed. Simple changes can have a profound effect on spider veins. Here are some easy and accessible treatments that you can adopt today. Stay away from the sun and wear dermatologically recommended sunscreen. Do not soaps and sponges that are too abrasive. Use gentler products on your skin. If these simple remedies seem to have no effect of spider veins, you can always opt for a more viable treatment. This treatment involves the use of chemical solution being injected directly into the spider vein/varicose vein to make them collapse and disappear. It focuses on causing damage to the innermost lining of blood vessels. You may need several sclerotherapy treatments to see complete and satisfactory results. Using Laser and pulse-light therapy, blood vessels are shrunk and sealed using the heat emitted from the Laser machine. Laser therapy is highly effective for spider veins and small varicose veins. You may require multiple sessions of Laser therapy to avail full benefits. There is little to no downtime and the sessions are short and painless. Another similar treatment called Photoderm or light therapy is used to shrink abnormal and small venules (tiny spider veins). It works of a different frequency than laser therapy as a wider spectrum of light is emitted rather than just a single beam of light. It is often opted by patients who do not want to use needles to treat spider veins. Often a last resort, widened blood vessels can be surgically removed. This treatment is extremely painful and the recovery time is often long with many side-effects. There’s no need to feel embarrassed about having spider veins. Feel free to consult with your dermatologist if you are suffering from this skin calamity. You deserve to have glowing and radiant blemish free skin. A writer by passion, she has had diverse experience in areas of beauty and health care; with topics like skincare, hair problems, tips and advices being her forte. She aspires to bring change in the lives of people through earnest and research based articles. Birthstones for Each Month & its Uniqueness: What is your Birthstone?